For his SS16 collection, we worked with Joshua Kane to create these lightening inspired detail to compliement the tailoring. We came across this great picture of Jack Guiness in one of the jackets with Ben Stiller, giving their best ‘blue steel’ looks and just had to share it with you! 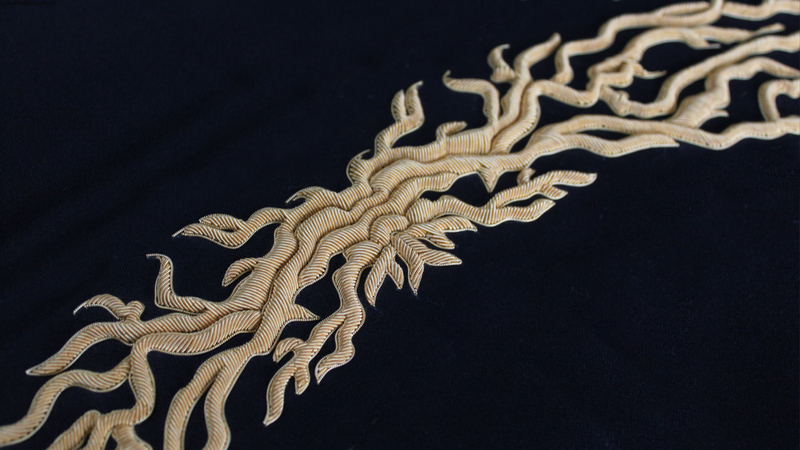 Here you can see some of the detail of the goldwork that goes unto the collar. The embroidery stands up from the fabric as it has been raised and each piece of bullion is cut to measure and hand applied to create this lux effect. And here the rest fo the jacket, I think you will agree, it is pretty special.